Thank you for your interest in attending the 2017 conference. You must have a profile in order to purchase tickets. Click the Create a Profile tab above to get started or Log In if you already have a Profile. Once you log in, go to My Dashboard and click the Tickets tab or click the Buy Tickets button below. If you would like assistance logging in or creating a profile, please email info@im4us.org. 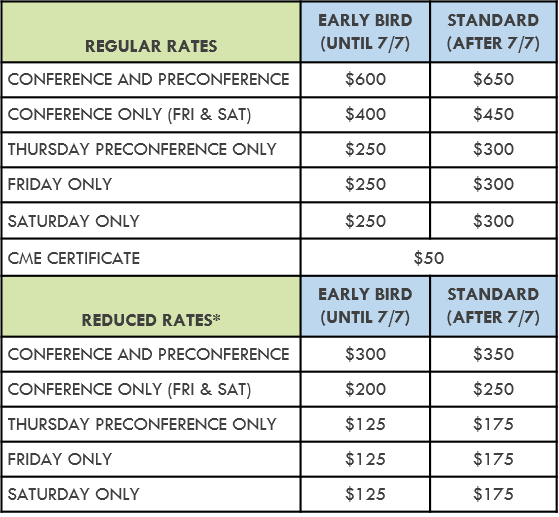 *Reduced Rates: We strive to make IM4US conferences accessible to all by offering reduced rates to those earning less than $45,000/year, students, community health workers, non-western medical providers/healers, and all providers/healers who are from the impacted communities we serve. No discount code required to register at the reduced rate. If the tuition discount is still insufficient, please click here to fill out a financial aid application. We have a limited amount of financial aid funds for assistance with registration, lodging, travel, and childcare. Deadline to apply for financial aid is May 31, 2017. Fees include breakfast and lunch. There is an additional fee of $50 for a CME certificate. You must fill out an evaluation for each course you attend in order to obtain a certificate. Confirmation of your reservation will be emailed to you upon receipt of your payment. Refunds may be given for tuition (less $25 processing fee) if your cancellation is received in writing no later than July 31st. After July 31st, we will not be able to offer any refunds. Attendee substitutions are allowed, but notification must be made in writing by August 4th. No refunds or credits will be given to ?no shows?. IM4US reserves the right to modify the course?s schedule or program as necessary. We also reserve the right to cancel this conference, in which case a full refund of the registration fee will be provided. We are unable to refund any travel costs (flight, hotel, etc.) in the event of our cancellation. The IM4US ANNUAL CONFERENCE is a unique educational experience for healing professionals, administrators, students/residents, advocates and the community to learn about affordable integrative approaches to common health conditions, share evidence-based best integrative practices, and be part of a like-minded community for activism around IM for the underserved. Our attendees consist of nurses and nurse practitioners, herbalists, acupuncturists, community health workers, health educators, naturopathic doctors, medical doctors, osteopathic doctors, chiropractors, physician assistants, homeopaths, midwives, dieticians, clinical nutritionists, students/residents, and researchers. The Northwestern University Feinberg School of Medicine designates this live activity for a maximum of 17.5 AMA PRA Category 1 Credit(s)?. Physicians should claim only the credit commensurate with the extent of their participation in the activity.